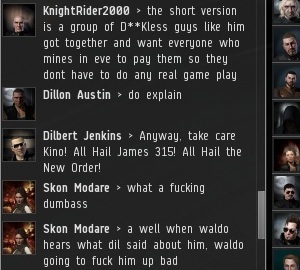 Becoming an Agent of the New Order is the most noble calling an EVE player in highsec can take on. Being an Agent can be difficult at times, but nothing is more rewarding. Today's post comes to us courtesy of another Agent who happened to be in Kino to observe Agent Dilbert Jenkins enforcing the Code. Note how Dilbert courteously educates the miners about the law of the system prior to enforcing it. Praying for salvation from CCP is usually a last resort on the part of disobedient miners, but they've been resorting to it more and more quickly these days. 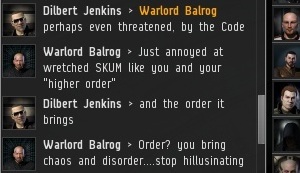 Not surprisingly, miners feel especially threatened as they witness more and more bumpers appearing, proving the New Order is not merely a product of the Saviour of Highsec's imagination. Like so many other space lawyers, Sirius Skrilium appears from out of nowhere to interject his worthless opinion. 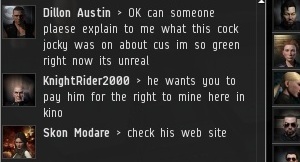 Luckily, no one got a video, so CCP will never learn that there are people MinerBumping in highsec. Dilbert handles questions about the legitimacy of my authority like a champ. 0.7 will never be safe again. 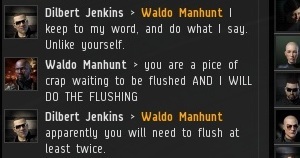 Not with Waldo on the case! Waldo continues to rage, but it's very difficult to intimidate those who fight under the banner of the Invincible Stabber. Word of the New Order spreads among the terrified miners. Now some miners are informed enough to be able to educate each other, without the assistance of a New Order Agent. Others still hope Waldo will be able to save them, but we haven't seen or heard from Waldo again. I guess he's carefully biding his time or whatever. "Naturally, he is unable to strike down an Agent of the New Order, but he does succeed in vaporizing a few nearby miners before getting Concorded himself" freaking brilliant! Some times I feel like miners don't understand WHY you created the code. They dont understand that by paying the fee they are joining the new order. 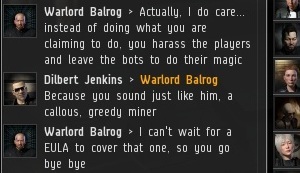 I guess they think you do it for the money and not to save the miners from bot madness. 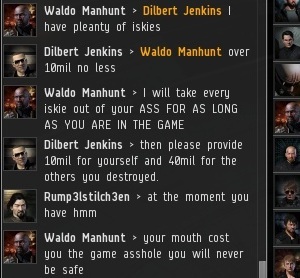 To create a new highsec, we must tear everything down and rebuild from the ground up. 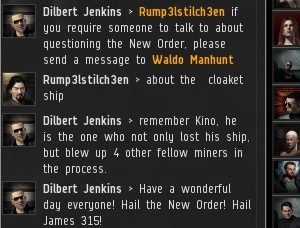 To create a new miner worthy of inhabiting our new highsec, we must tear the miner down and rebuild him from the ground up.